I just send you the mail again to ask about the 2nd antibody for fluoroscence WB detection. I sent you the specification information on chemidoc system that we want to use last week but didn't get reply yet. According to BioRad web sites, each color emission filter can detect below dyes. Thank you for your message and for your patience. It is difficult to find three secondary antibodies in three colors that woudl be suitable, but I hope the following will help. Please check the excitation and emission wavelenghts and spectra to ensure they are suitable for the machine you are using. (I say this because some of the blue dyes they suggest go into the green range in the light spectra). I can recommend to review the online datasheets for further information. The following may fit into the blue channel on the instrument you are using, but I can suggest to please check this. The emission spectra is slightly into the green spectra. I am sorry we do not have any that are tested and covered by the 6 month guarantee in western blot to suggest on this occasion. The antibody to be conjugated should be in 10-50mM amine-free buffer within a pH range of 6.5-8.5. Modest concentrations of Tris buffer (up to 20mM) are also tolerated. 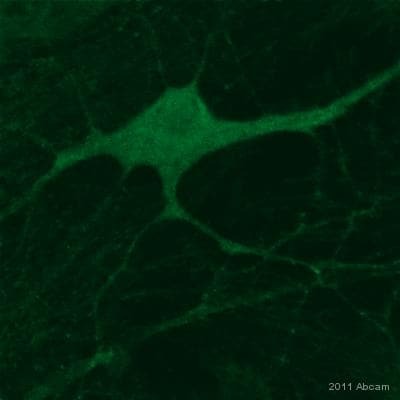 Currently using ab28373 in hamster tissue (IHC-Fr Fl), but not getting any signal. Is there any NR2B antibodies that would work with hamster tissue. I have continued to try and find the hamster sequence for NR2B to see if there is any antibodies in our catalogue that may work for hamster, but I have not been able to find the hamster sequence. There is a chance that ab65783 might work for you, but without the hamster sequence, I would feel unsure recommending it to you. If there is any chance that you could find the sequence and forward that to me, I would gladly do the alignments and see if there is a chance that it would work for you. Would like to try this antibody with hamster samples. Thank you for your call today. I've issued the discount code below for testing ab28373in hamster samples. This code will give you 1 free primary antibody before the expiration date. To redeem this offer, please submit an Abreview for ab28373 in hamster samples and include this code in the “Additional Comments” section so we know the Abreview is for this promotion. For more information on how to submit an Abreview, please visit the site: www.abcam.com/Abreviews.